BOSTON (JTA) — Jewish and interfaith vigils were held around North America in memory of the 11 victims of the Pittsburgh synagogue shooting. In Boston, one of the speakers Sunday at an emotional vigil on the Boston Common was Ariel Stein, a Boston University student who is a member of the Tree of Life Congregation, where Saturday’s attack took place. “It is up to all of us to love each other … and to stand up for the other in society,” Stein told about 1,000 people. As a young girl, Stein said she often sat in the Tree of Life synagogue alongside her grandmother. In Canada, vigils and rallies were held in Montreal, Ottawa, Halifax and Vancouver, among other sites, according to the Richmond News of Vancouver. In Ottawa, a vigil Sunday at the Soloway Jewish Community Centre drew more than 300 people. Eleven chairs were left vacant on the stage, each bearing the name of a victim of the rampage, the newspaper reported. On Saturday night, hundreds gathered in Brooklyn’s Prospect Park to sing, pray and speak out against the violence, WNYC reported. On Sunday, more than 1,300 people filled Congregation Ansche Chesed on Manhattan’s Upper West Side and hundreds more spilled into the streets for a solidarity rally. In Chicago, in addition to prayer services held at numerous local synagogues, an interfaith gathering was held in Federal Plaza in solidarity with members of the Tree of Life synagogue and those killed last week in a suspected hate crime in Kentucky. 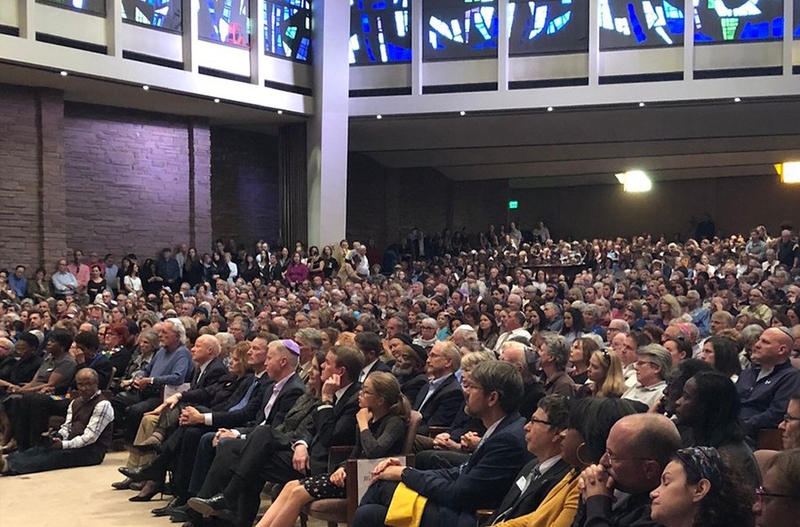 In Denver, some 2,500 people crowded Temple Emanuel, a synagogue that normally seats about 1,800, on Sunday night. Among those offering remarks were Colorado Gov. John Hickenlooper, Mayor Michael Hancock, Police Chief Paul Pazen and clergy representing the Christian, Sikh, Muslim and Jewish communities, the Denverite reported. Jews and their allies around the world also remembered the Pittsburgh victims and prayed for healing. In Jerusalem, some 500 Americans and Israelis gathered Sunday night at Zion Square for a candlelight vigil. The event was organized by The Meeting Place Dialogue Group, The Jerusalem Movement and the Hartman Institute Hevruta program, The Jerusalem Post reported.